The Dutch art dealer E.J. van Wisselingh (1848-1912) and his British wife Isa (Isabella Murray Mowat Angus, 1858-1931), daughter of a Scottish art dealer, moved to London in 1892. The same year, Van Wisselingh opened The Dutch Gallery at Old Bond Street 26. He showed and sold Dutch and French paintings. 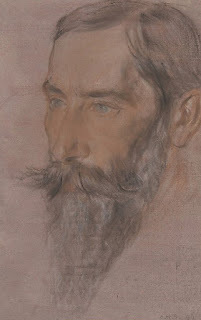 Ricketts and Shannon met the art dealer in the 1890s en he exhibited their drawings, lithographs, and wood-engravings, in London and in The Netherlands as early as 1895; later he would also put their pastels and paintings on show. In 1900, Van Wisselingh was the first to sell a Shannon painting to a public collection. Ricketts and Shannon befriended the Dutchman, and occasionally they made use of him, for example to bid for them at auction, or to buy furniture for trade prices. Ricketts had his first one-man show of paintings at Van Wisselingh's gallery in 1906, and when Van Wisselingh died, Ricketts designed the lettering on the urn. A Van Wisselingh show of works by Ricketts and Shannon was characterised in a review: 'This is modern of the moderns, as is always the case here' (The Times, 8 July 1902). Shannon made several portraits of Van Wisselingh. In 1895 he executed two portraits in lithography, 'E.J. van Wisselingh' and 'E.J. van Wisselingh in a hat'. In 1899 Shannon finished and signed a portrait in black, white and red chalk (on pink paper) that originally was owned by Van Wisselingh, and in 1924 was still in the possession of his widow. In 2005 the portrait was bequeathed to the Metropolitan Museum of Art in New York by its famous curator William Slattery Lieberman (1923-2005) who had worked for the MET since 1979. 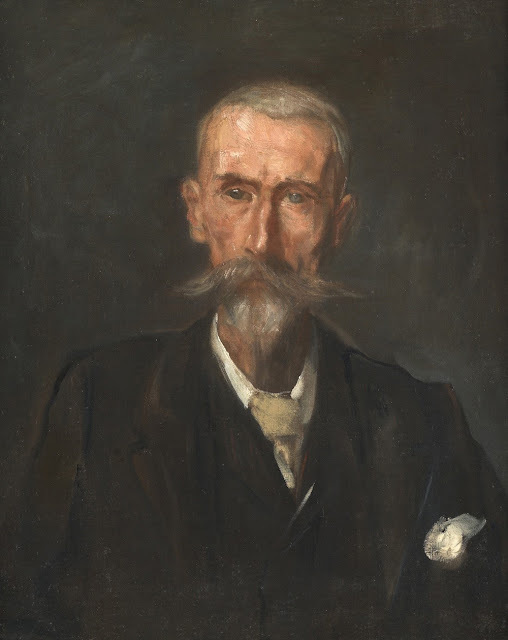 Another portrait of Van Wisselingh was done by Shannon in 1900. It is an unsigned oil on canvas, 24 to 20 inches, that was given by the artist to the artist Francis Dodd (1874-1949), later given to Henry Rushbury (1889-1968), and through inheritance left to the painter Theo Ramos. The painting was sold by The Canterbury Auction Galleries on 8 October 2013, and is now offered for sale at The Maas Gallery in London for £8,500.